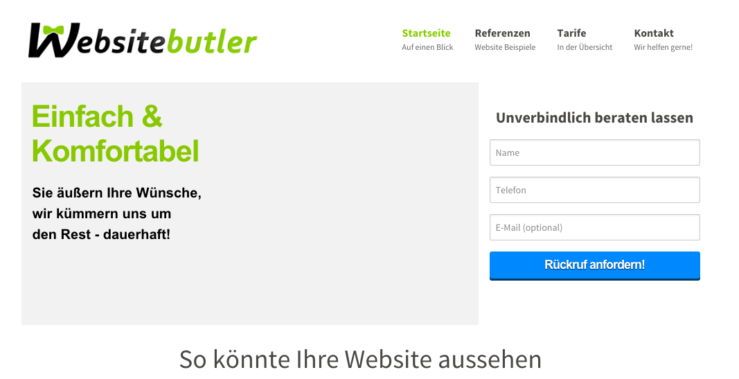 Looking for an Adobe Muse alternative? 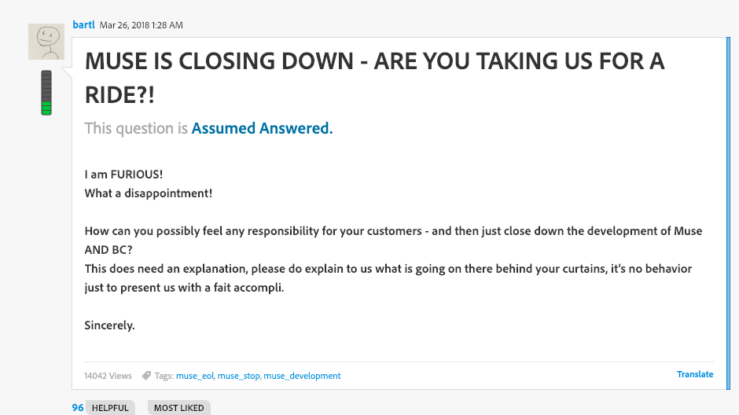 Adobe Muse is shutting down! Find out why Sitejet is the perfect alternative. Adobe has dominated the design software industry for years. They grew by paying careful attention to the market, then building software when—and only when—they knew it’d be profitable. Along the way, they garnered thousands of fans and supported hundreds of growing design companies. But relying on Adobe’s software can be a double-edged sword for creative professionals, as thousands of those designers learned. Adobe started realizing web designers were leaving them for other platforms, and their platform Muse simply wasn’t able to compete. So in March of 2018, Adobe dealt a blow that sent the web development world reeling. They announced they were discontinuing Muse forever. Specifically, the final feature release of Adobe Muse was announced on March 26, 2018, along with the detail that all technical support would end two years later in March of 2020. Unsurprisingly, people weren’t happy with the decision. In essence, they’ve realized that simpler platforms exist. And today, you’ll learn why Sitejet is the perfect replacement for former Muse users—both for simple and more advanced sites. We’ll cover the differences and advantages of Sitejet, and by the end you can make the choice yourself. So, how do Muse and Sitejet stack up? Can you create great sites with both of them, without much technical know-how? And would it ever make sense to use code—whether that’s your own level of knowledge or hiring a developer? Let’s start with the biggest selling point with Muse: it doesn’t require any coding. That’s the primary reason Adobe created the program in the first place, and it remains the key differentiator between it and competitors. Adobe also has a bulkier product called Dreamweaver that focuses on coding and the more technical side of website creation. In many ways, Muse was the mid-level alternative to Dreamweaver. It provided custom design abilities while still allowing designers to use the app without code. While Muse was notoriously limited for creative designs outside the provided cookie-cutter options, there was still the ability to extend the software for something unique. But between 2012 (when Adobe launched Muse) and 2018 (when Adobe shuttered Muse), there was a shift in website creation towards either apps with extensive custom coding or basic out-of-the-box templates. In response to that trend, Adobe canceled Muse and offered the bare-bones app Spark as a semi-replacement. 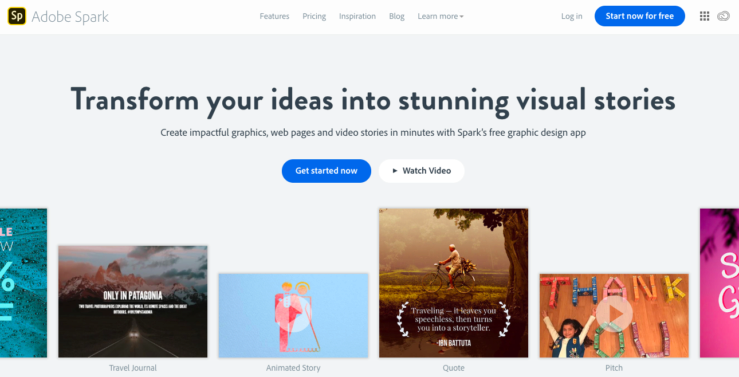 Spark only works with the most limited of templates, essentially allowing you to create a single landing page based on their version. Those who were interested in moving to Dreamweaver met with an even bigger frustration. In Adobe’s own words, Muse widgets aren’t compatible with Dreamweaver. The essence of the move on Adobe’s part was to cut out the middle of the web design industry. For those looking for insultingly simple sites, there’s Spark. For those willing to jump into custom coding, there’s Dreamweaver. But for small business owners, agencies, and solo designers looking for development power without the steep learning curve, there just isn’t anything to come by in the Adobe suite. Sitejet sits on the completely opposite side of the design spectrum. First off, our history is completely different. While Adobe created Muse from market considerations and built around what would sell best, Sitejet was created first for designers. It started out as an in-house piece of software we used to design hundreds of client sites. In fact, here’s our site’s home page from way back in 2013, when we were first getting started in the custom design business. As we gained more and more clients, we kept making revisions all the time to our software for a faster, smoother workflow. And then we saw its huge potential and decided to package it as its own program for other designers to use—Sitejet. Because of that history, Sitejet is created exactly for the web designers Adobe has cut off for profitability. First off, Sitejet uses built-in blocks you can quickly drag and drop, no coding required. These include everything—headers and footers, forms, expanding boxes, pricing displays, menus, and even display-ready separators. But we also know that there are plenty of designers looking for a what-you-see-is-what-you-get (WYSIWYG) solution, who also know a smattering of code—or more. That describes our team pretty well. We like designing things quickly and visually, but there are times when we’d just rather type up some code. Because of that, we added coding to Sitejet. So if you’re more technically-minded, you can quickly open up the coding sidebar in Sitejet and have at it. There are more amazing features in Sitejet’s design process, including premade (but editable) templates, copy-and-paste website setup, and others. The big picture is that Sitejet is designed for the very group Adobe Muse abandoned. Designers who want something more than a vanilla template, but aren’t really interested in coding an entire site line by line. If that describes you, you’ll love Sitejet’s streamlined design process. With design out of the way, let’s take a look behind the scenes. While you can design a site on any platform, the real test is how well it stays online. If the servers aren’t up to speed or require a huge amount of technical know-how, it’s not going to be worth it. And today, security is more important than ever. Hacks seem to be getting more and more common, with tens of millions of user profiles leaked in 2018 alone on major sites like Facebook, Google Plus, and Reddit. Now is not the time to be flaky with security. So, how do Muse and Sitejet compare? The primary method of hosting through Adobe Muse was (and still is) Business Catalyst. This is a software-as-a-service (SaaS) product that allowed Muse creators to host their sites online without needing another hosting option. But with its close ties to Muse, Adobe announced in early 2018 they’d be closing Business Catalyst along with Muse. Originally, Business Catalyst (also known as BC) was planned to stop working in March of 2020, but due to the backlash the move received Adobe pushed that date back to 2021. In other words, all sites hosted through BC will disappear from the web on March 26, 2021. The primary strategy—and what Adobe itself recommends—is to download all the Muse website data, find a third-party host, and keep the site alive there. This method works, and one could theoretically keep a website alive indefinitely like this. But there’s a glaring problem, and it’s why no serious web designer should stick with Adobe Muse any longer than absolutely necessary. 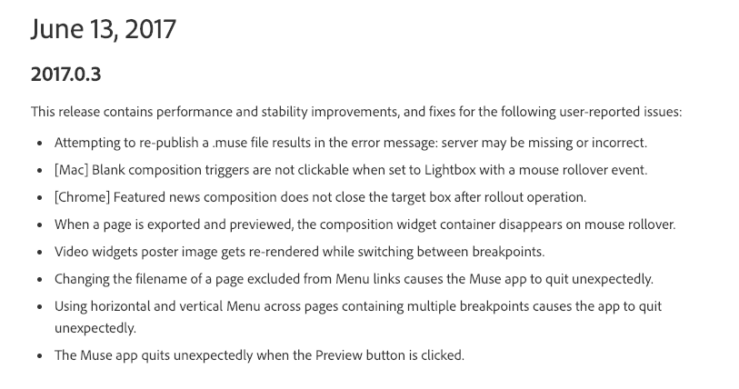 That reason is that Adobe will not be releasing any more updates to the Muse platform after the March 2018 update. This is a problem because new security vulnerabilities are discovered frequently—usually every few days or weeks. For example, the U.S. National Vulnerability Database, maintained by the United States Government, lists eleven vulnerabilities published in January of 2019 alone. For a website program that’s regularly updated, these don’t pose much of a problem since the vulnerabilities pertaining to site hosting or development can quickly be updated. But for a platform like Muse that won’t ever be updated again, this is a major problem. It’s like setting “12345” as the password for all your accounts, then never changing it for years. No savvy internet user would do that, and no savvy website developer would continue to use Adobe Muse without regular updates. If you liked Adobe Business Catalyst, then you’ll appreciate Sitejet. It’s a built-in system that doesn’t require outside help or technical know-how. 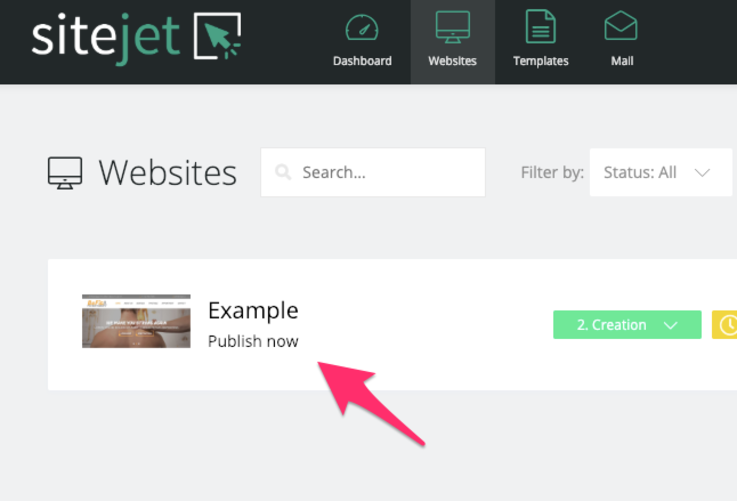 To publish a design on Sitejet, just hit the “Publish now” button. Literally—that’s it. Your site will immediately be live online, maintained on Sitejet’s servers. And that’s true of every site you have—it’ll stay there, and you don’t need to find another hosting option. As far as security goes, you’re safe with Sitejet. Unlike Muse, we’re constantly updating our platform to keep it bulletproof from hackers. And we provide a lot of the services the most secure sites use. For example, secure socket layer (SSL) protection is included on every site. When it comes to security, Sitejet is a clear winner—and will only become a stronger alternative as the Muse system continues to break down in the months leading up to March 2021. Next, let’s look at a feature that’s vital for anyone who runs a website design business—keeping up with customers, managing client sites, and keeping track of the business aspect of website design. Many of Muse’s customers are agency owners or solo designers. Which program supports this business model better? When it comes to the capabilities of Muse to help coordinate client accounts and build recurring revenue, there’s not much to say. First off, you can pair it with Adobe Creative Cloud for $52.99 USD per month. With this, you get the whole suite of Adobe apps, including a few that can help with client management. With Adobe Bridge, for example, you can keep files and color schemes together. But that’s about it. And $50+/month sounds expensive for something that you could do for free with Google Drive. Despite its focus on “creative professionals,” the Adobe software suite puts more emphasis on the “creative” aspect than the “professional” side of things. When it comes to coordinating client feedback, managing assets and messages through a customer portal, assigning tasks, and tracking website design progress—you’re out of luck. Muse never had these features, and it never will. If there’s one area where Sitejet really shines in comparison with Muse, it’s client communication. Let’s start with client feedback. Every site starts with some idea of what the client wants, then grows through a continual set of adjustments as the designer and client work together to bring their visions to reality. Unfortunately, this is usually a tough process. Instead of harmoniously working together, most client-designer relationships are fraught with stress and miscommunication. 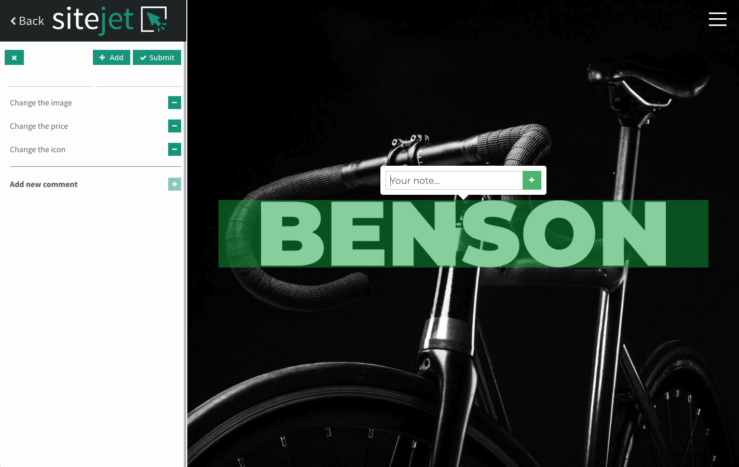 Clients can input notes directly into the site. And once you share the site with a client—whether it’s live or in development—he or she can click on each element and add notes and suggestions. Stop sending back-and-forth emails and playing phone tag just to make a few changes. Sitejet will handle it for you and keep the notes where they belong—right in the design itself. Next, Sitejet helps you keep track of progress. Instead of keeping a to-do program separate from your design software, why not incorporate them? That was our vision, and that’s what you get with Sitejet. You can set the current stage for every site you’re working on. Each site comes with a built-in to-do list. You can assign team members, set deadlines, and keep track of progress with every revision. 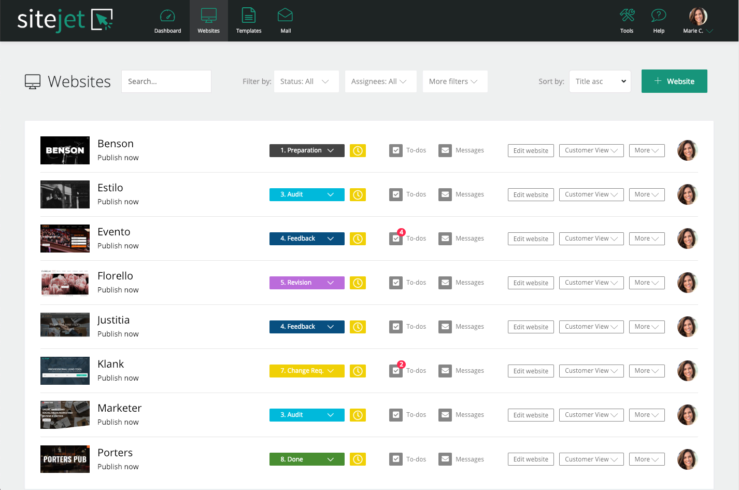 Plus, Sitejet has a built-in dashboard where you can track upcoming tasks, current customers, and keep your finger on the pulse of the company’s clients and financials. 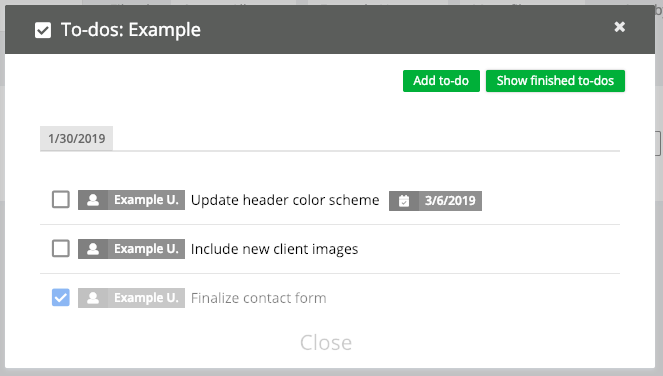 Client contact information is right there, too, so you can connect with people quickly and easily to grow your business. In short, it’s a designer’s dream. Once you work with a site design program created to integrate client feedback, keep projects on track, focus your efforts on revenue, and keep everyone in the loop—you’ll never go back. We’ll wrap up this comparison article with the very issue that brought Muse into the discussion in the first place. Updates, support, and customer relations. If you decide to make the switch to Sitejet, will you feel abandoned by the team? That’s how hundreds of Muse users felt after Adobe announced it was shutting down, and many spent the day yelling on forums with curt responses (if any) from the Adobe team. Is Sitejet the same? Let’s look. 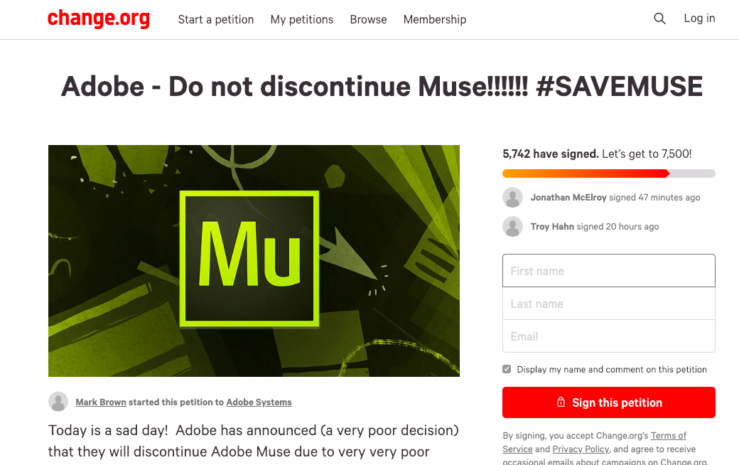 Adobe’s decision in 2018 to cancel Muse wasn’t well received by most customers. Since many designers had built their businesses around Adobe’s platform, it meant starting from scratch with every client website and building their clientele a second time. The move was met with an understandable amount of hostility. One former Muse user managed to get over 5,000 signatures on a Change.org petition. 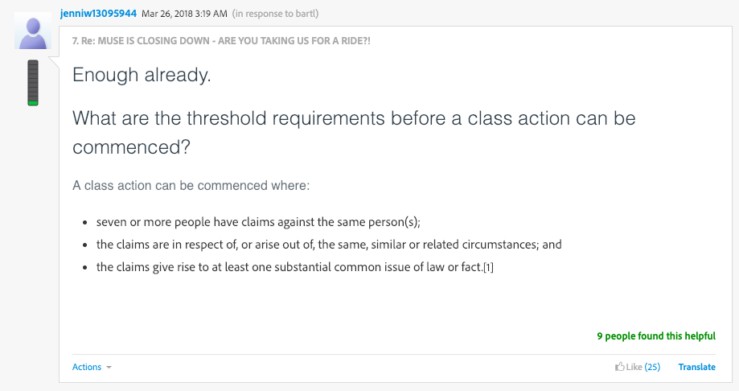 Some even threatened a class action lawsuit against Adobe (though don’t hold your breath waiting for a check in the mail). But, of course, Muse was around for years before announcing the program’s close. What did their updates look like beforehand? Well, there weren’t many updates, according to their own release notes. There were three feature releases in 2016. Two in 2017. And only one in 2018, which also announced the program was shutting down. And as we’ve mentioned before, there won’t be any more updates—ever. Amidst those releases were also a few bug fixes. That’s important, but hardly exciting or worth paying attention to. The customers of Muse were there for powerful features, and quite frankly Adobe didn’t do a great job delivering on that. For example, nearly every modern website uses responsive design, that is, a layout that automatically adjusts to mobile devices and tablets just like desktop displays. Responsive design has been around since 2011. But even though responsive was clearly the future of web design in 2012, the Adobe team chose to ignore the trend for whatever reason. Instead, responsive design didn’t come to Adobe Muse until four years later, in February 2016. And apparently responsive widgets were a big deal, because it still dominates their front page over a year later (right under the announcement that Muse is shutting down). The responsive update has been criticized for slowing down site build times and overcomplicating the platform. Some even claim it was this update that made Adobe realize the software was easier to kill than maintain. All this boils down to one main point: Muse was never Adobe’s priority. 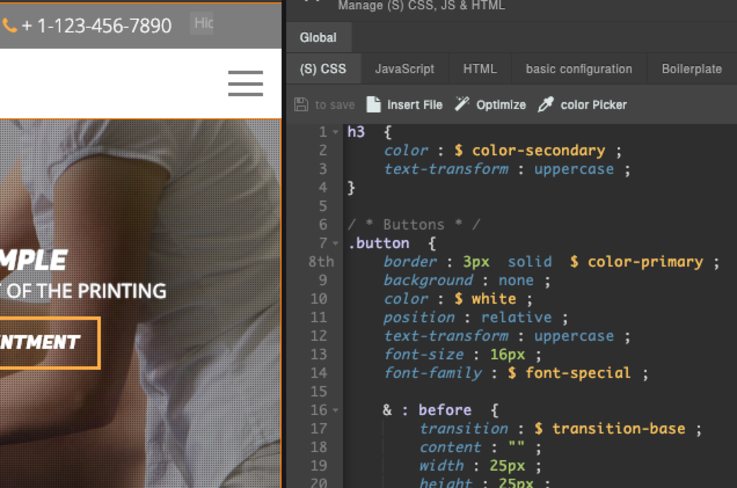 In the web design field, Adobe has been focusing their attention on Dreamweaver, the premium design product for custom coding. Dreamweaver has been around since 1997, and it’s probably not going anywhere. Despite Adobe’s huge resources, Muse never seemed worth it for the Adobe team. 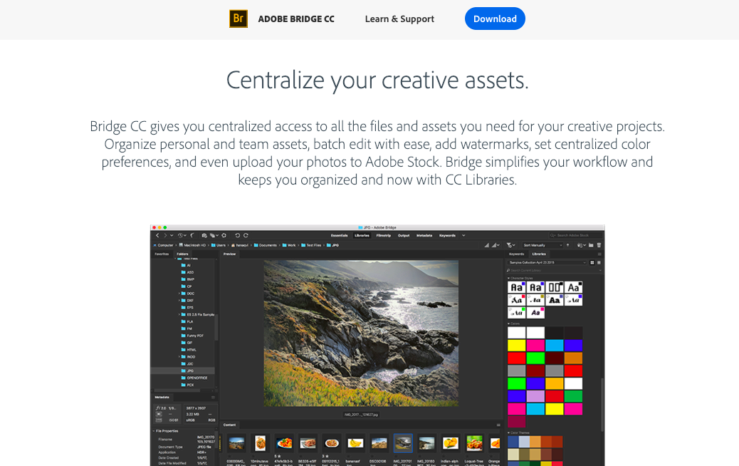 For a minute, imagine the opposite of Adobe—a giant corporation with thousands of developers, spread thin across dozens of projects. Whatever you’re thinking of, it’s probably close to the team behind Sitejet. 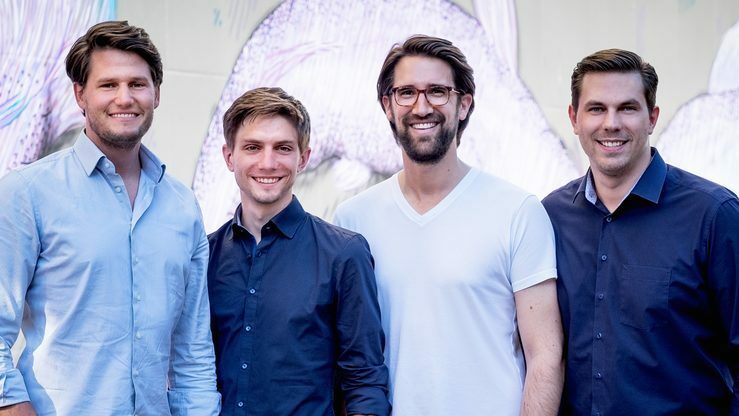 We’re a passionate startup led by four guys committed to one goal: making Sitejet as amazing as possible. We’re constantly updating and improving to keep up with new capabilities and trends. 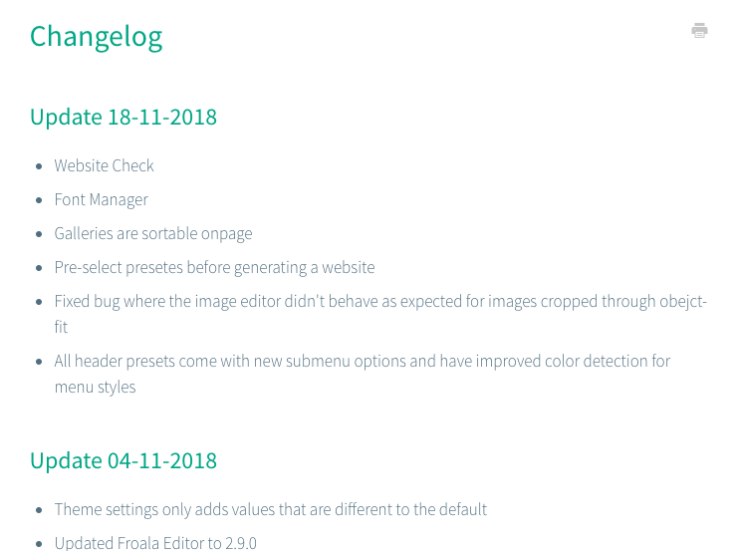 Adobe Muse released six feature updates in three years—that’s the same number we published in two weeks. But it’s more than that. Our users aren’t just anonymous serial numbers on a forum. We have a dedicated Slack channel—a chat app that’s available with our support team—where our team personally responds to issues. Our support and development teams are closely connected—so updates don’t have to go through levels of hierarchy before getting added to the system. In fact, our developers frequently jump into the channel to help with support. When was the last time you got Adobe tech support from the developer who wrote the software you’re struggling with? We’d guess that’s never happened, and it’s just one of the many reasons you’ll be blown away with Sitejet. If you’ve been a long-time user of Adobe Muse, the end of the program probably came as a surprise. You had built sites on there, learned the ropes, built a skill set—and it was all thrown away. We can’t imagine what that must feel like. Frustration is just the beginning. But we’d like to offer a next step. A seamless transition, if you will, to a better platform that isn’t going anywhere. If you enjoyed the simple customizations and do-it-yourself design process at Adobe Muse, you’ll love what Sitejet has to offer. 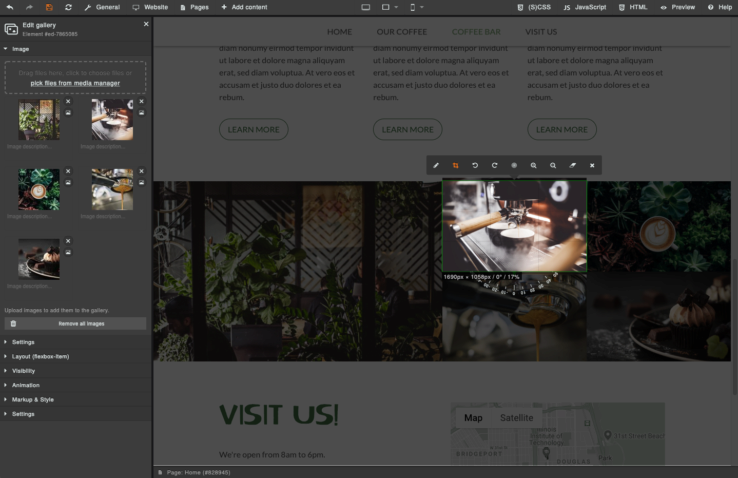 Even better, you can create even more complex sites than Adobe Muse could. As your sites grow, you can grow into Sitejet instead of hitting the limits of Muse. Sitejet comes with built-in hosting, meaning there’s one less hassle for you to worry about. And our built-in client communication tools lets you grow a business in ways you never could with Muse. But perhaps most importantly, you’re never just a second-place customer with Sitejet. Our focus is on the program, and we’ll do anything to keep improving it. Unlike Adobe, we don’t have a “more premium” piece of software like Dreamweaver to push. Our focus is on you, always. While you can still use Muse, the bugs and security vulnerabilities will be coming faster and faster in the coming months. When you’re ready to make the switch, just let us know. We’re here to help.